RUP Record helps private pesticide applicators comply with the record-keeping requirements of the federal regulations on restricted-use pesticides (RUP). Failure to comply with these regulations can result in civil penalties of $500 or more. Your phone provides the date, time, and location information. RUP Record remembers your name and applicator id. 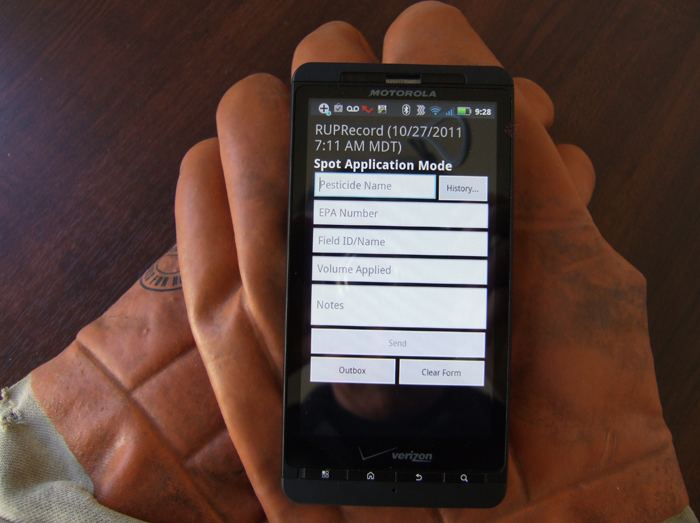 All you do out in the field is fill in a simple form with the application-specific data. The resulting record, which meets the USDA requirements, is then emailed to you. Print it out, drop it into a file folder, and you’ve complied with the regulation that the information be on file within 14 days and be kept for at least two years. Use RUPRecord for keeping track of both spot and area applications of one treatment substance or a mixture. It remembers the names and ids of the restricted-use pesticides you’ve applied, making it even easier to record additional applications from the same container. If you don’t have cell phone service out in the field, no problem. The app stores the email in its own outbox, waits until you get in range of a cell phone tower, and then transmits the record. Please note that your state may have its own record-keeping requirements that exceed those of the USDA and, if so, you are fully responsible for meeting those requirements. We do provide the ability for you to define your own named data collection fields. These that may allow you to enter the extra data required but it is up to you to determine if the resulting record does, in fact, meet all applicable standards. Note also that this app is only intended for use by private applicators. It does not meet the USDA RUP record-keeping requirements for commercial applicators. Nor is it intended to generate records that satisfy state or federal worker protection standards (WPS).